Explore hundreds of brilliant free digital music education resources – Having nothing to say and saying it: my blog. 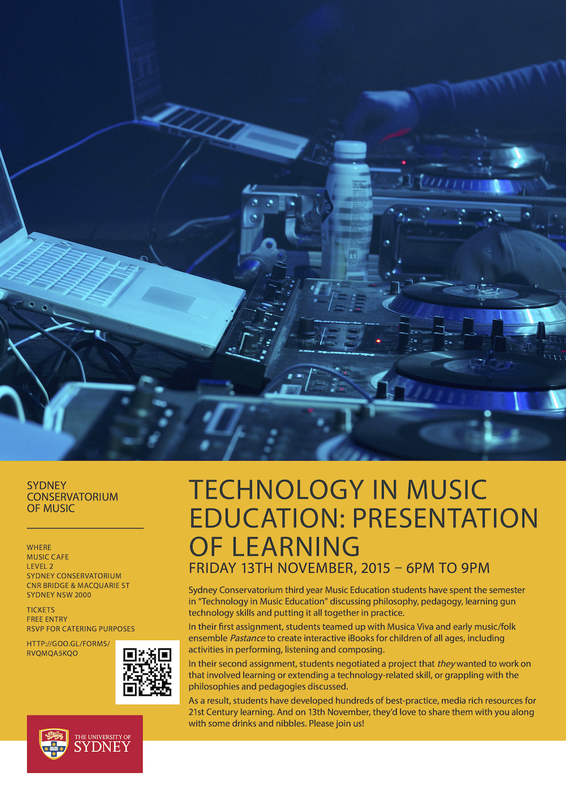 This Friday evening my Technology in Music Education students are going to share all of their work at the Sydney Conservatorium of Music. You can read more by clicking here. If you can’t get to Sydney, though, you don’t need to miss out. The students have been blogging about the process (and even their lecture notes!) on their public websites (part of the course outcome is to create a professional online presence), and also tweeting with the hashtag #SCMTME. There follows a list of their websites and Twitter accounts, and we’ll consider running a Periscope of the evening’s celebrations on Friday, so keep an eye out! Please do interact with these wonderful preservice music educators by commenting on their blogs or Tweeting to them. It makes the whole experience so much more meaningful. Pingback: Presenting: the 2016 Technology in Music Education cohort | Having nothing to say and saying it. Pingback: SCM Technology in Music Education 2017 – Having nothing to say and saying it: my blog.